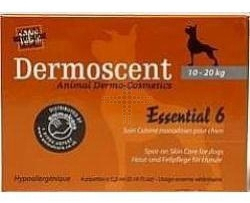 Suitable for cats and dogs, Dermoscent Essential is a quick, easy and effective spot-on skin conditioning system suitable for dogs weighing up to 10kg. Dermoscent contains a powerful blend of naturally sourced essential oils, formulated in a snap pipette for easy owner administration. Promising fantastic results, Dermoscent can be used on areas affected by hair loss, squamosis, dryness, oiliness and odour. Below are some recent questions we've received regarding Dermoscent Essential Oil Pipette, including answers from our team. Please list the all the ingredients in this ? What’s in It ? The innovative formula of Essential 6® spot-on is subjected to rigorous selection of the 100% natural active ingredients: a synergy of 10 essential oils (clove, camphor, gaultheria, rosemary, curcuma, oregano, lavender, peppermint, tea tree and cedar), hemp oil and neem oil, rich in essential fatty acids and vitamin E.
Can you tell me how often you have to apply this treatment and for how long? This can be used as and when needed but most people use it on a weekly basis especially for the first few months.